We saw a new game at the club today - Kings of War. It's a free set of fantasy rules from Mantic Games. FoG-N. Kendall's 1815 Prussians got a 25-0 win against Brett's Tyrolean rebels. Moderns. Al and Philip had a 15mm Moderns game using the revised WRG rules. 3000 points of 1960s British and Russians, recently painted by Andrew. FoW. A couple more games, Lyndon (US) v Rob (German), and Steve (Soviet) v Kit (German). And finally, another Bolt Action WWII game with some very nice terrain. FoG-N. Kit and AL had a game, again both using their British armies (Peninsular and 1815 versions). Saga - Alan's Norse Gaels defeated Rob's Skraelings. DBR - In a training game for CanCon, Philip's Spanish defeated Stu's French 8-2. FoW - A couple of games, Lyndon (US) v Rob (British paras), and Steve (Soviets) v Kit (Germans). WHFB - An Empire civil war in the game between Rob and Dan. Kendall (Anglo-Russians) had a drawn game with Mike (Ottoman Turks), both sides waiting for a Turkish outflank that never arrived!. Shaun (1814 French) beat Philip (1815 Netherlands) in a game based on the Flames of War dust-up scenario. The French took the objective and defeated the Dutch before the Dutch reserve cavalry could intervene. Brett (1813 French Cavalry Corps) got a 22-3 win over Stu (1809 Saxons). Kit and Steve had a Flames of War game using Germans and Russians. DBMM 25mm - Benny and Rob had a couple of 240 point games using Anglo-Normans and Medieval Portuguese. Bolt Action also made another appearance at the club, with a couple of nicely modelled British and American forces. The main event of the day was the Leipzig refight. Fought over three tables, and using almost all of Brett and Kendall's collections with some other models drafted in, it was an impressive sight. The Allies (Brett, Andrew D, Mike, and Kendall) defeated the French (Stu, Allan, Philip, and Kit). Andrew H did all the organising and also pushed around some figures to keep the games going. 27 October - No club meeting today with many of the club away at Flames Con and Heavy Metal Con. Alan and Greg used Breton and Strathclyde armies in a Saga game. Kendall and Philip used two of the more uncommon Napoleonic lists, the 1805 Anglo-Russian Expeditionary Force and the French Army of the Orient. A win to Kendall. Mike and Steve had a Flames of War game. DBMM 25mm - Andrew's Han Chinese defeated Philip's Saite Egyptians. The Greek allied contingent (recently painted by Andrew) was making good progress against the Chinese infantry, but the loss of their general led to their defeat. Flames of War - Greg and Mike had a Polish v Polish training match. One was a mechanised force, the other had heaps of artillery. A very quiet day at the club, with Guardcon on this weekend. Alan and Philip had a couple of Saga games using Vikings and Anglo-Danes. Other than that, it was a day of casual drop-in visitors. There's another meeting next week (a 5th Sunday meeting). FOGN - Brett had two games using his 1814 French army, getting a win against Kendall's Prussians in the morning, and a hard-fought draw against Kit's British in the afternoon. Rob had a WHFB game, and several Saga games with Alan. PoP 2013 was won by John Way using his Dutch Rebellion army. Grant Brown was second and also won the Best Army prize for his Polish army. DBMM 15mm - Brett's Japanese under the brilliant Yoshitsume defeated Andrew's Hittites also with a brilliant general Muwatallis. FOG-N. Keith's 1812 French defeated Philip's 1815 Netherlands Corps. Kendall's Prussians defeated Andrew's Peninsular British. Three games of Flames of War between Mike H with a Puma army and Mike G, Gervais (Canadians) and Steve (Soviets), and Steve against Rob. Lots of Saga games happening today with an interesting variety of armies, including Rob's new Skraelings and several of Alan's. Two more FOG-N games. One had two British armies, Kit's 1815 Brits beating Al's Peninsula army including a newly painted Spanish division. 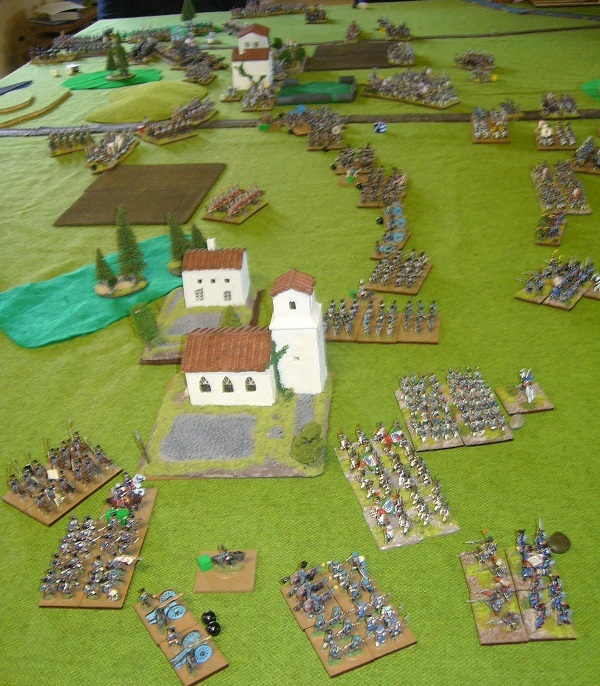 DBMM 28mm - Benny (Carolingians) had a DBMM game with Philip (Saite Egyptians). A decisive win to Benny, practicing for Call to Arms next weekend. FOG-N campaign game. Andrew H commanding the French took on Kendall, Mike and Philip with a combined Prussian, Russian and Austrian army. Both armies were still on the field at the end of the day, so the battle will go to a second day which will be played at the next club meeting. FOGN - Brett's Austrians defeated Shaun's Bavarians. Mike's Turks defeated Andrew's Russians.